Tablet sales are expected to exceed 100 million this year, meaning that responsive design has never been so important for those looking to optimise their online content. Indeed, some sites are already experiencing up to 40% traffic from tablet and mobile devices, a strong commercial imperative to accommodate the smaller screen size in a unified design. Content is vital in #SEO, good quality content which is regularly released improves your search engine ranking page positioning, therefore a further advantage of responsive design is that fewer resources can be wasted in low-level duplication of content across sites, the content need only be applied to a single site, increasing your chances or a higher search engine ranking. Additionally Google suggest that mobile optimised, responsive sites are featuring prominently in localised search results. This is obviously of huge significance to high street and online retailers, amongst other burgeoning mobile use cases. Clients will also find it much easier and less time consuming to manage and maintain a single site, with much less content to manage. Additionally a single administrative interface can easily be optimised, using layout and workflow tools to manage the correct content, or site templates that are being used for different devices. Business logic can be applied such that the overall multi-device experience can be significantly enhanced within a single administration, like in our CMS. Within our CMS, for example, editorial users are marshalled to produce the requisite content, appropriate for each device screen size, therefore maximising the benefit and minimising what can be a huge editorial administrative overhead with separate sites for mobile. Responsive design allows site owners to deliver quality content to audiences across devices, the offline browsing capabilities of #HTML5 mean that sites can be easily accessed ‘on the go’. As HTML5 enabled tablets and smart phones proliferate this will become increasingly important. Email newsletters, and content contained in hybrid HTML5 web applications will increasingly be consumed on the move and in the absence of an internet connection. #ResponsiveDesign allows you to stay ahead of the trend. As the demand for media rich mobile internet and apps is burgeoning, several important implications must be addressed; development and maintenance costs, visibility in search engines and better conversion rates. It is these factors combined with a unified approach to design that will be beneficial for all stakeholders. With the increase in Tablet sales and smartphone device use exploding, responsive design is key to keeping up ahead of your competitors and establishing market share; content consumption on mobile devices will only continue to balloon as 2015 progresses. 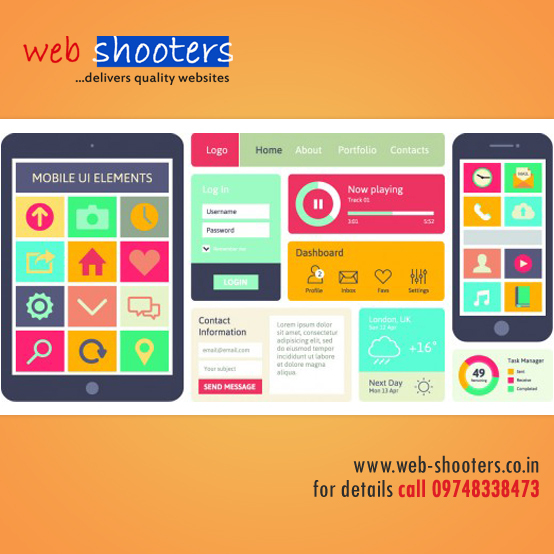 Call us at 09748338473 to develop your own #Website. Reblogged this on Website Designing With Kaushik DG.